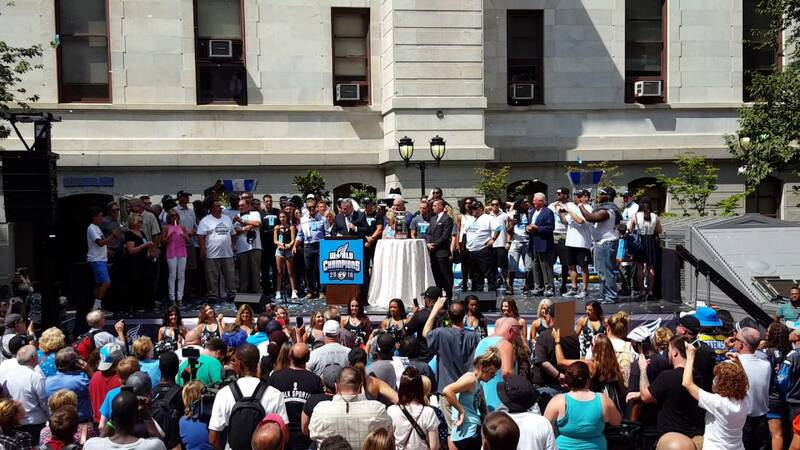 The Philadelphia Soul held a rally at City Hall on Wednesday. There were some fans there, and mostly media, team staff and city workers. It was nice. Aug. 31, 2016, 2:28 p.m. 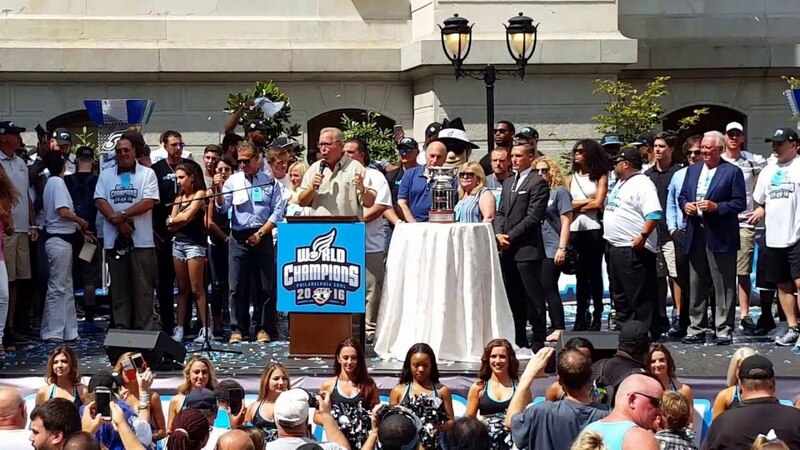 If you missed it last Friday, the Philadelphia Soul won the Arena Football League championship, their second such title in the last eight years. As Philly isn’t exactly a hotbed of professional sports success over the last…carry the two…100 years, the city decided to honor the Soul with a rally at City Hall on Wednesday. It was nice. Here are some photos and videos of what you missed, because we were there. We know you weren’t. Well, this guy was there. And he got painted up for the occasion. Note to that guy. The rally was not in an air-conditioned arena. Paint melts in the hot sun. He should have taken cues from this guy. At that point, the speakers started playing Queen’s “We are the Champions.” I will admit a little part of me died. The news media was out in full force. We probably could have each interviewed one fan and there maybe would have been enough fans for everyone there covering the rally. Maybe. The fans who were there were, at times, pretty adorable. While there aren’t a lot of Soul fans, they are a loyal lot. We should all be happy for them. Well, maybe not for this guy, who spent money on a Jaworski jersey because he 1) is a hipster who doesn’t like the team enough to buy a player jersey or 2) doesn’t actually know the names of any of the players and bought this jersey on his way to the rally. There were actually a few Jaws jerseys. It seems that’s a thing. But this guy has a better idea, though you can’t exactly scream “lifelong fan” when your shirt has a big 16 on it. Hey look everybody, it’s Soul emcee Vinnie Caliguiri! Caliguiri hosted the event for the Soul, and did a great job making the crowd seem way more energized than it was. He also talked a ton of smack about the other Philadelphia pro teams not being winners. That’s a weird thing to do at a rally with less people than are on an Eagles sideline. Fun fact: if you own a Soul helmet, you can play quarterback in at least three games. Where does The Soul Man rank in the history of Philadelphia mascots? He’s somewhere between the Phanatic, the St. Joe’s Hawk and Hip Hop, that godforsaken Sixers rabbit who hopefully died on the way back to his home planet. The players, to their credit, were very excited to be at the rally. Defensive back LaRico Stephenson got the crowd excited for free stuff! Quarterback Dan Raudabaugh earnestly thanked the fans for supporting the team all year. Hey look, it’s new Eagles defensive end Jake Metz! The Arena Bowl trophy was there. It has a bodyguard. Seriously. A bodyguard. That’s one smooth looking bodyguard. And he made sure the trophy was clean. Then he stared lovingly at the trophy. Hey, it’s Jaws, the most successful sports owner in Philadelphia! Hey, it’s minority owner Marques Colston! Hey look over there! Confetti! It’s not quite Bill Clinton with a balloon, but Jaws was pleased with the amount of confetti. Mayor Jim Kenney has had a tough week. He seemed genuinely happy for the win. …do not panic, but there is a man in a dark suit with glasses right behind you. Here are a few more pictures of Kenney, in case you’re looking to make an attack ad or something. Back to the rally. Jaws was FIRED up. Owner Cosmo DeNicola took the mic and used it as an opportunity to start naming all the Philadelphia neighborhoods who are now champions thanks to the Soul. DeNicola then ripped on Dallas and Washington, saying they hadn’t won two titles in the last eight years. The guy next to me quietly said, “uh, neither did the Eagles.” We’re pretty sure everyone was thinking that. Head Coach Clint Dolezel spoke briefly, and thanked all the fans and everyone in attendance for their support. He told those in attendance to give the Soul a try, speaking mostly to the media who he hoped would relay that message. Consider it relayed, Coach! He’s still feeling the heat. In all, the rally was nice for the team, even if it wasn’t exactly a packed affair. And the players deserve the day. Many of them have to take on second or third jobs — for some, arena football is their second or third job — with very little recognition or even acknowledgement that they exist. The Soul exist, and they’re the most successful pro team in the city. Congrats to them for that.